strong, durable, waterproof, robust, high strength 7075-E9 Easton aluminium poles, the flysheet is in under-coated 75 Dernier ripstop nylon and tent material are tough, the floor is in Taffeta Nylon 70 Dernier coated in PU to guarantee waterproofness. This thing is a beast for any condition, climate, season, roomy for two, palace for one. Been rained on heavy and completely waterproof, 2 roomy vestibules with full flat doors that can configure in a multitude of ways, a true 4 season beast. Can use without fly when no rain, all windows and door screen cover up with thick zippered tent fabric. takes a little more time to set up, fly is large, but that is a strength after set up, with footprint weighs in on my scale at 9lb 14oz complete with poles, stakes etc--even though that is a little heavy, that is really a strength and why it is so strong and durable. This tent is discontinued, so the point of a review is moot. But I have had this tent for 15 years. Car camped, backpacking, and bush flying. Desert, mountains, snow and rain. I have no complaints. It is a 3-4 season tent. Kinda tight with two people in the winter, but any other season, roomy enough. Great solo. Super easy to set up. Easy to clean. I just pull the steaks, and lift it over my head and lower it so I am standing in the door with my head inside. I don't know if you could do that with clips. have used this tent for more than 40 nights. sweet tent. not the easiest set up. a bit tight. awesome fly. floor could be thicker and bathtublike. overall awesome tent. I bought the nebula to replace my 3 season tent. I used it for the first time, in Banff National park. In early December. It held up to wind, shrugged of snow. And performed perfectly. I had no condensation problems, but was alone. Found the vestabules spacious, and the tent palacial for solo trips. I have used it in any kind of weather and ad no problems. It has never leaked nor been seam sealed also. The option of variable shelters has also proven to be what it should be. Never had to deal with North Face customer service; but REI definetly has the best customer service I have ever had to deal with. We seen some crazy places with our Nebula! It is our main showplace away from home most of the year(3seasonably) and has been so for the past 5 years! From Gila,NM to Yosemite to Southeast Alaska, and back here in Washington. When we first got her we seam sealed it once(back in 1997) and still don't worry about leakage, even in this here wet wonderland. Yes, condensation can happen but it will happen to any tent, so use your guy lines smartly! We once had mountain goats spying on us right through the "stargazer" window wanting to lick us in the early North Cascades mornings! We split the tent up between eachother for travel, one gets the fly, footprint,& stakes-the other gets the tent body & poles. This way if one of us gets split up we still have a functional shelter just in case we get separated. Rainfly door is cleverly converted into different options for the fussy homemaker weather dictating. Spacious vestbules in front and back keep life happy! See you soon with our Nebula in some backcountry near you! Warranty Dept. is great! They'll help with anything and now that Vanity Fair owns them we'll have warranty service forever but never had to send her for repairs. I purchased The North Face Nebula based on all the good reviews I had read. I used this tent on the Wonderland Trail on Mt. Ranier and my main complaint was condensation inside the tent. In the morning our sleeping bags and pads would be soaked. I had tried leaving the screens and vestibule doors open to allow the air to flow through, no luck...still lots of condensation. If The North Face had just made one simple change to the tent I think this would solve the condensation problem. They need to make the pole sleeves out of mesh to allow air to flow through the top of the tent and eliminate moisture. Other than this problem I was pleased with the tent. 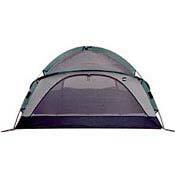 The double vestibule works great when two people are in the tent, it allows each person their own entrance. I never had problem with the seams or bathtub leaking during a rain storm and we had a few of these on the trail. Also the color of the tent should be changed to a light blue or yellow, instead of a depressing green. I give the Nebula a 3 out of 5!! Never had to use yet!